One of the biggest struggles in our house is making sure all three kids get their homework done, do their reading time, get stuff ready for school and sports, eat a good dinner, brush their teeth and get to bed on time! The hardest part for me is the first 3 hours the kids are home from school. First off, they want to kick back and relax, unwind, eat a snack. Then they want to play with the daycare kiddos which often means getting the gang all riled up because the little ones are so excited when the big kids get home. And once the bigs and littles have started playing…..it’s all over. Nobody is getting their homework done or focusing on chores. After the last kiddo gets picked up, then it’s super-speed dinner time and we’re out the door for our evening activity. 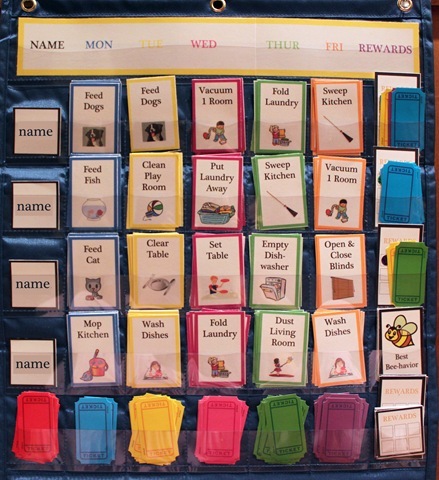 We’ve tried “chore charts” and “task charts” in the past. Here’s one I made when Trevor was little….and it worked well for a while…. But it wasn’t easily customizable. THIS is exactly what I need! There’s room for all 3 kids, there’s a spot for each day of the week, the chores can be easily switched out or traded or moved around to best suit our schedule and needs….I LOVE it! It’s PERFECT! The blog that the image was linked to gave complete instructions on how to create it, along with a downloadable file you could use to print your own copy…..but you know me, I like to do things MY way. Many of her tickets didn’t apply to our family, and there were others that I needed to create. Not liking to mix and match things, and wanting something a little more “mature” looking, I’m now creating my own “task cards”. I need to find a Pocket Chart (I’ve found them for $19.99 online) or come up with my own pocket-chart…but sometimes it’s simpler to just use what someone else has already shown to work well. Previous Previous post: JOIN OUR SUMMER READING CLUB! Next Next post: Doesn’t get any CRISPER than this!